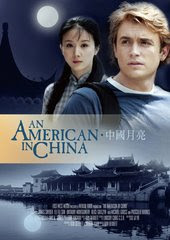 While the title An American in China may indeed be forgettable, one has to admit, it’s probably a better choice than "Love in the Time of Outsourcing" yet the unlikely merging of romance and outsourcing comprise the plot of director Ron Berrett’s independent film. James Snyder stars as David, a twenty-two year old recent Stanford University graduate, whose aimless plans to promote beach volleyball as a valid sport and negotiate a relationship with his vain, promiscuous on-again, off-again lip gloss obsessed girlfriend take a backseat to family duty when his dad urges him to head to China to explore the prospect of building a factory there for their toiletry product empire. Quicker than you can say, this film is about to go down the drain in a series of overly cheesy, hip and tired clichés including an obligatory slow-motion car wash scene with David’s bimbo sister, the required funny best friend, and a lame beach volleyball fight (all of which would probably have been vetoed from Beverly Hills, 90210), Berrett’s An American in China saves itself when it takes David out of the states and outsources the plot to China. First hit with the culture clash of an entirely different society in Shanghai, David is even more shocked when he’s brought to a remote village seemingly untouched by modern technology where the film becomes a nice hybrid of a coming-of-age plot blended with a fish-out-of-water tale. Romance is thrown into the mix as David begins to find himself falling for the beautiful, intelligent, and hardworking Mei. Played by a winningly earnest Sun Fei Fei, it's Mei, a factory employee who is trying to fulfill her dream to attend Beijing University while balancing her own ambitions with her loyalty to her loving family, who helps David to realize that there is quite a difference between simply being a dreamer and trying to achieve a dream. Seemingly inspired by The Graduate with a bit of Lost in Translation thrown in for good measure, amazingly, much is gained with the translation as the film’s tone shifts from gently moving and bittersweet overseas to generically one-dimensional and lowbrow whenever it touches American soil. While the evening news and major public opinion might tell a completely different story, in the world of Ron Berrett’s An American in China, the success comes from outsourcing and those who can overlook a frightfully disastrous opening will find themselves delighted by his story of David and Mei.